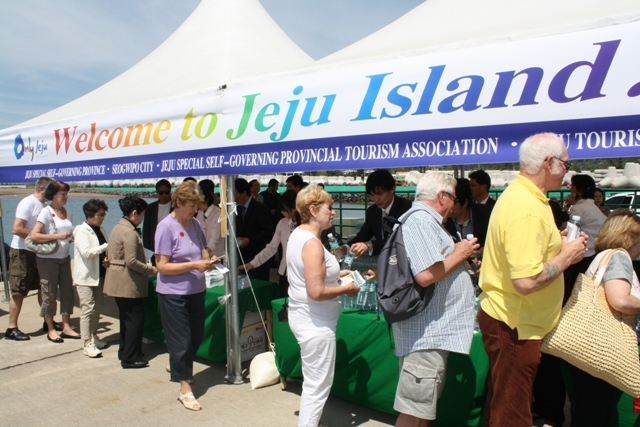 As many as 590,000 cruise tourists visited Jeju in 2014, again breaking all previous records and confirming Jeju as the most popular port of call in Asia. A total of 16 ships arrived on 242 occasions. Compared to 2014 there were three more ships (23 percent rise) which stopped on 58 more occasions (31 percent increase), carrying 210,000 more visitors (52 percent increase). The growth is driven by Jeju being at the center of Northeast Asia between China and Japan, and the world-class scenery. Officials have already raised the bar for 2015 and expect 650,000 with growth expected in familiarization tours with 20 ships arriving 320 times. Large cruises to call at Jeju this year include the 114,500-ton Costa Serena, the 72,458-ton SkySea and the 9,963-ton Celebrity Millennium. Authorities say they will work on ensuring that ships stay longer in port and use more local products to increase benefits to local residents.